NAME: It is a mandatory field. It represents the internal name of the item type. PROTECT_LEVEL: Level at which the data is protected. A mandatory field. CUSTOM_LEVEL: Level of user who last updated the row. Again a mandatory field. WF_SELECTOR: It stores the name of the PL/SQL procedure which implements selector function. This is an optional field. PERSISTENCE_TYPE: Indicates whether item type is temporary or permanent. PERSISTENCE_DAYS: Number of days until purge if persistence is temporary. Workflow Item Type Display Name and description can be found in WF_ITEM_TYPES _TL table. ITEM_TYPE: Internal name for the item type that owns the attribute. A mandatory field. NAME: Internal name of the attribute. A mandatory field. TYPE: Each item attribute is assigned a datatype, such as “Character”, “Number”, or “Date”. There are three fields to hold a default value, but only one of them will be populated for any item attribute, depending upon the datatype. For example, if you create an item attribute with a datatype of “Number”, and then supply a default value, that value would be stored in the “number_default” field. The “format” field stores information about a format mask that should be applied to number or date values, and the “subtype” field contains “SEND” or “RECEIVE”. The Translation table is WF_ITEM_ATTRIBUTES_TL and the related view is WF_ITEM_ATTRIBUTES_VL. ITEM_TYPE: Internal name for the Item Type that owns the message. NAME: Internal name for the activity. VERSION: It is used to support multiple versions of the same process running at the same time. The version number works in concert with the “begin_date” and “end_date” fields, to ensure that only one version of any activity is active at any given time. By versioning, the previously launched processes retain the process definition that was in force at the time they were launched. TYPE: The “type” field is the way that the individual types of activities can be distinguished. There are five valid values found in the “type” field: “FUNCTION”, “NOTICE”, “EVENT”, “PROCESS”, and “FOLDER”. RERUN: Determines if activity is rerun during looping. EXPAND_ROLE: Determines how many roles are required to respond to a notification activity. 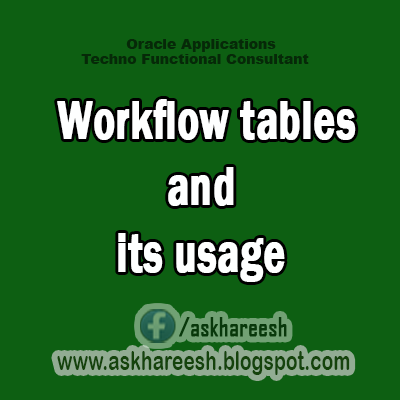 FUNCTION: For function activities only, the field is used to store the name of the PLSQL procedure that the Workflow Engine should call to implement the function. RESULT_TYPE: If you intend to model transitions in a process based upon values returned by an activity node, then the expected results must be predefined by supplying a lookup type, which is stored in this field. ICON_NAME: Name of activity icon used in process window. MESSAGE: For notification activities only, the field called “message” will be populated. In these cases, it will contain the internal name of the message that the notification will deliver. ERROR_PROCESS: Workflow process to run in case of an error. ERROR_ITEM_TYPE: Name of item type to execute in case of error. RUNNABLE_FLAG: Flag (Y or N) to indicate if activity is runnable. FUNCTION_TYPE: Indicates whether function type is pl/sql or internal.